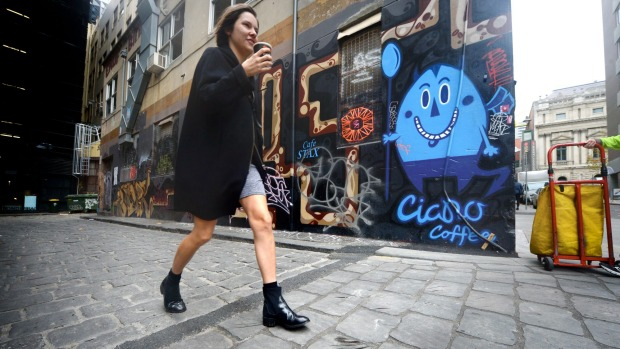 Melbourne’s maze of grungy-but-chic lanes and alleys has been attracting tourists for years. But new works being carried out by the City of Melbourne in Literature Lane, near RMIT, raise questions about the delicate balance between amenity, safety and the more nebulous concept of “character”. As part of its $4.4 million 2015 Streetscapes Improvement plan, the City of Melbourne is ripping up the lane’s 10,000 irregularly surfaced bluestone cobblestones, cutting them flat and relaying them. The works cost $400,000, of which about a quarter will be spent on cutting and replacing the stones. Although the backbreaking works will make the lane safer and easier to navigate for cyclists and pedestrians, particularly those in high heels, they will permanently change lane’s appearance. But not everybody is convinced. Chamil Kelly, 31, manager at Wonderbao, a restaurant overlooking the lane, says there are probably better ways to spend money. “I kind of like the look as it is – that’s Melbourne. Changing the laneways is changing Melbourne,” he says. Asked why the City of Melbourne was carrying out the bluestone works, it referred us to its Streetscape Framework, a 20-page document with flow charts and explanations about how the Streetscape Co-ordination Committee chooses sites. And, although the council is motivated by a range of imperatives, safety is always high on the list. In the current financial year there were 51 claims relating to injuries on roads and footpaths in the City of Melbourne with only one settlement of $1631 paid out due to road conditions causing damage to a vehicle. Whereas no personal injury payouts have been made so far this year, since 2008 the council has spent $222,273 on settlements and legal advice relating to injuries on roads and footpaths. But interestingly, it’s never been harder to sue local governments for personal injury. Professor Ian Malkin, co-author of Focus: Torts and lecturer at the University of Melbourne, says federal-driven changes implemented to varying degrees by state and territory governments in 2002 and 2003 have resulted in somewhat higher thresholds for breaching duty of care and reduced or capped damages claimants can seek. The City of Melbourne owns 87 bluestone lanes in the CBD and similar cobblestone cutting works have taken place in Bright Place and are planned for Healeys Lane. Contractors working on Literature Lane estimate it will be finished by mid-June. This story was originally published in The Age and the Sydney Morning Herald.